We celebrate 25 years of Praxis Records, 20 years of Datacide Magazine and also 20 years of Sub/Version Records. 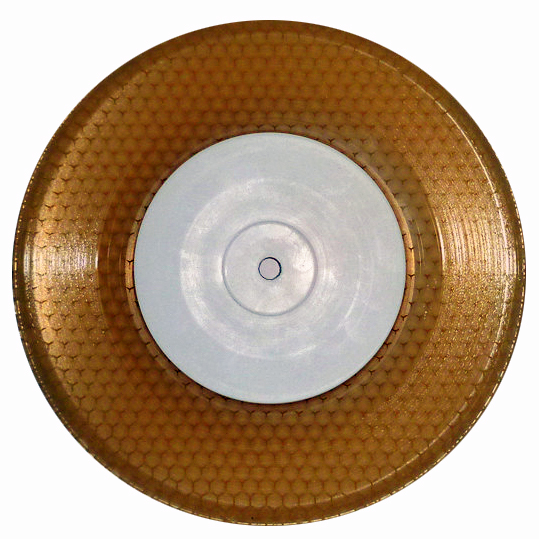 Honey Disco is a label from Canada that releases single-sided, clear 7” vinyls with beewax on the flipside and honey smell included.The first two releases by Hristo and Koosh contain some cool funkedelic disco-dub. Number three By Eddie C was my favorite so far, with a dubby downtempo tune that reminds me slightly of T.Rex’ “Hot Love“. I heard number four by Osmose recently, wich works in a similar way, re-working Billy Idols “Sweet Sixteen”. Irish producer Myler with 3 tight and rumbling techno tracks, released in 2014 on Untolds Pennyroyal label, soundwise somewhere between JoeFarr, J. Tjin and Randomer with those thick bassdrums and a certain funkiness that all of them have in common. The other record came out in ocbtober 2016 with 4 tracks and a locked groove on vinyl and one good digital bonus track that goes in direction of the pennyroyal material. A1 is shuffling breakbeat techno, quite ok. A2 and AA2 are more or less solid techno tracks but the real gem is the AA1 track “D’Electrocution” which is raw, straight forward basement techno with an intriguing filtered piano. Opinions might differ about this, but for me it totally works. Vernissage for Datacide 15 with ZELLER live instore & More! Datacide Fifteen is out and was presented last weekend at the London Radical Bookfair. We return to Berlin for an early evening of experimental sounds and radical insights. This is a Soli Party which means a fundraiser for various print projects connected to Datacide, the magazine for noise and politics, which has been exploring the overlaps and frictions of radical (anti-)politics and electronic music since 1997. With our fundraisers we have always followed the course that we aimed at finding a happy balance between providing exclusive, exciting and in many cases incredible international and local acts, covering at least their travel and other expenses as well as providing a fat sound, and the aim of funding our radical media projects. DATACIDE FIFTEEN. The next regular issue of the magazine will be out in October 2015. Articles and contributions are being assembled now and we’re excited and confident that the upcoming issue will be another killer. Since 2011 we have published Datacide on a yearly schedule. At the very least we intend to continue this, but we have more in store: Books, a German edition, and we would like to increase the frequency of publication. BERLINER KRISE. We are currently preparing a – kind of – German edition of Datacide. We have been based in Berlin since issue number 10 of Datacide came out. We’ve been very active, organising numerous parties, events and a couple of successful conferences, but we feel that the „missing link“ is a German language publication. BERLINER KRISE will be a 12-page A3-size newspaper which will feature translations from previous issues of Datacide, German language „versions“ of articles as well as exclusive content. Datacide Book: EVERYTHING ELSE IS EVEN MORE RIDICULOUS. A complete reprint of Datacide issues 1-10 in one massive volume with new introductions and an index. We decided to do a thorough edit of the original layout and find a balance between correcting mistakes and improving readability one the one hand, retaining the original vibe and look and most importantly the complete content of the original issues. All these projects are scheduled to appear in the next 2-5 months. For this we need money and support. TRÜBE AUSSICHTEN FÜR DIE BOURGEOISIE at ZGK is our next party. If you are in Berlin, come and join us. If you’re not able to attend, but you want to support our projects, please consider a donation or take out a subscription to the magazine. Paypal address: info@datacide-magazine.com, subscriptions cost EUR 15.00 – or more at your discretion – for 3 issues incl. shipping to anywhere in the world. More information can be obtained by writing to the same email address.